What is not often observed is that Elizabeth has great depth to her interests: in another life, she might well have been involved in agriculture or veterinary science. Her knowledge of horses, for example, is among the most profound of her kingdom. Far from being merely a great horsewoman who rode sidesaddle yearly in the Trooping the Colour ceremony, she controlled her mount from this position when her panicked animal reared, during the June 1981 Trooping the Colour, when a lunatic fired six shots from his starter’s pistol directly at the Queen. She is the mother of the Princess Royal, an equestrian competitor in the 1976 Olympic Games who won her position on merit, and she is also great breeder of horses, a task she loves. Her knowledge of the great horses of the world is such that she is able to propose the mating of specific animals to produce thoroughbred horses of great value. Her late racing manager Lord Porchester was her closest personal friend. Elizabeth made an endearing remark in June 1961 during the State Dinner with the Kennedys at Buckingham Palace. When she and the First Lady, a lover of the arts, toured the picture gallery, the Queen stopped before one image and said “that’s a good horse”, instantly reading the animal’s carriage and bone structure. The Queen’s annual two months at her privately-owned home on 40,000 acres at Balmoral in Scotland is a working vacation, but a vacation nonetheless. Every single day, however, she is presented with red government dispatch boxes, as were her predecessors, filled with government documents from throughout the Commonwealth. Hence the sincere compliments from heads of state that the Queen is shockingly well-briefed and occasionally knows more about a subject than they do. The same individuals who draw caricatures should try to match wits with her on the subject of agricultural and economic policy in Zimbabwe or patriation of the Canadian constitution, not to mention the possibility that the Queen herself will be attacked by al Qaeda as a thank you to Tony Blair for the Iraq War. She gets this holiday in exchange for virtually no time without her remarks being monitored by butlers and the BBC, with facial expressions being caught in terrible light by photographers and accompanying narratives written by tabloid reporters. The only solution is to strip all conversation of opinion and depth, which provokes more insults regarding Elizabeth’s intelligence and education. There is literally no way to win. When Diana’s crash occurred, neither the British nor the French governments were allegedly aware of her presence in France. Disturbingly, the CIA was aware and would later share data with the British in order that a formal, three-year inquest of the tragedy might be undertaken. (The “special relationship” between the US and UK permits both to avoid breaking their own laws by getting the other to conduct reciprocal espionage. The fruits are then turned over to the relevant nation. Thus, it is no surprise that the CIA may be much better briefed on the Royals than MI5, as they can invade and invade to the nth degree with impunity. Politically motivated assassinations are sometimes alleged to be conducted in the same fashion, particularly since President Ford’s 1976 Executive Order banning political assassinations abroad. A whole communications network has spread throughout the major English-speaking nations since the 1960s with the ECHELON program which permits members to bypass their own laws and spy all they want.) Even the senior-most Royals were labouring in the belief that she was in London at the moment of her death abroad, thus being caught utterly unprepared for the events to follow. It is almost universally alleged that the Queen remained behind the eight-ball throughout the week of Diana’s death, showing the sclerosis not only of the monarchy as an organization but of the monarch as a person. In those seven days, the Queen was called upon to take or participate in a series of decisions and actions that she firmly believed to be inappropriate, morbid, in poor taste, hypocritical, unconstitutional, historically unprecedented, damaging to her young grandsons, organizationally chaotic, and dangerously ad hoc. That she made it from one Saturday when Diana died to the next when the exquisite funeral took place might retroactively be regarded as a miracle and not a bureaucratic log-jam. That the Queen was not on the forefront of each decision was only to be expected. It is for her staff to propose historically unprecedented gestures, here carried out with the speed of machine-gun fire. The idea, however, that the Balmoral sequestration would instantly be scrapped for a woman who was literally no longer a member of the family made no sense to the four deeply conventional senior royals and to their advisers. I myself remember learning that Elton John would be performing at Westminster Abbey during the funeral and recoiling. It was only as the performance unfolded that its appropriate and moving nature became clear. It was a week in which nothing made sense, in which the brilliant young cad Charles Spencer became a national hero, a status he lost in the following years after reported cruel treatment of his ex-wife. Spencer’s address in the Abbey provoked ovations around the globe; the verdict of history was that it was magnificently written and delivered, inappropriate, impertinent, opportunistic; and telling of Spencer’s personal demons more than any other thing. Many say that Diana would have been greatly upset by the attack on the Queen she always respected and on the institution to be headed by her children. Tony Blair should slip a few banknotes under the table to British actor Michael Sheen for doing so much to resuscitate his reputation. Margaret Thatcher was rightly and regularly crucified in the press for hurrying to the scene of disasters in advance of the monarch, who was to precede her in protocol. In this way, Thatcher managed to politicize tragedy. Who is to say that Blair wasn’t doing something of the same in his famous management of the drama of Diana’s death? Fictional Tony shouts at his intimates, his wife and his spin doctor, in defense of the Queen and her lifelong record of service only months from his former attitude of casual post-monarchism. The director made a decision in good taste that the children never be depicted or quoted. Indeed, this throttling by virtue of the world’s never-ending concern for “the boys”, as they fell grew older and fell endlessly out of discos, meant that confidential information relating to the night of their mother’s death was not made public or put to an inquest until so far along that no possible benefit could come of it. The UK inquest was ceremonial and produced no useful new information regarding any assassination plot regarding the Princess of Wales when it was concluded in December 2006, if such information ever existed at all. Family members are cast for their appearance very much at the expense of dramatic competence. In exchange for a vague resemblance to Philip, we have an actor, James Cromwell, who does a less convincing English accent than an American high school student staging a Shakespeare play. Cromwell’s undeniably patrician appearance has generated a truly hilarious curriculum vitae. He has played countless American Presidents, kings, judges, etc., yet I have never seen him play any well or accurately, except for when he plays generic figures in, for example, Tom Clancy adaptations. In Oliver Stone’s W., his former President Bush (41) was all bluff, machismo and explosions, when the real former President is sentimental, repressed, and vague, sometimes bitchy. These sorts of misadventures in casting make one wonder restlessly if no tall, balding man in his late 70s could be found in the British Isles instead; does one really need to destroy a film about the British monarchy with an American actor? The television actor Alex Jennings, who passingly resembles Prince Charles, was so thoroughly incompetent that I discovered disbelievingly that he was actually English after all. The Queen Mother is wonderfully rendered. While we have seen the Queen Mother style herself as a human sunflower throughout the years, insiders knew of her store of the sarcasm and undisguised malevolence that the Queen herself was unable to produce. The Queen Mother’s unnecessary ostracism of the widowed Duchess of Windsor, for example, was cruel enough to provoke young Charles to visit the Duchess himself out of sympathy. The Queen Mother’s dialogue and delivery are believable according to the historical record and all that is known about her character. The only jarringly false line comes when she implies that the throne is unsafe with Charles who was, in life, her beloved grandson in whom she could see absolutely no wrong. To say that she was partisan in the divorce is an understatement. For those acquaintances to whom the Queen Mother looked like a charming, ideal granny with remarkable social skills and a tea-stained smile, she has the reputation of one of the great actresses of her long era. (She is played here by another great actress, Sylvia Syms, who captures the Queen Mother’s devastating charm and wit, and who delivers a wonderful line: “I don’t know, dear: Nobody tells me anything.”) The Queen essentially never disobeyed her and had absolute faith in her judgment. Far from being an old dear shut up in an attic with her booze and her racing forms, she controlled Elizabeth to the day of her death. Unfortunately, The Queen Mother and Prince Philip both took a very old-fashioned and ungenerous view of the blended and shredded modern families from which so many of us derive. An ex-wife is not necessarily a mortal enemy or someone one pretends is dead in advance of her actual death. The Queen’s approach to ex-daughters-in-law is actually very different, and to this day, she has a surprisingly warm and constant relationship with the feckless Duchess of York. The Prince of Wales shown in this film is a cack-handed, obsequious disaster. In reality, he took as much control as he was permitted within the framework of his role, and attempted to return the body of the mother of children, and his Princess of Wales, as quickly and formally as possible, very much against the wishes of other senior royals. That the ex-husband of newly-minted Saint Diana would be depicted as a homunculus was inevitable. In the opening moments of The Queen, we discover Mirren’s stylized banter with a portrait painter who reminds her that while she may not legally vote, the government that results in any election belongs to her. This same banter would reappear when Blair appears at the Palace so that she might invite him to form a government. Her controlled irony strikes me as a note too sophisticated for the straight-shooting Lilibet, as her family calls her. Mirren’s monarch is arch, with inflections of the wonderful and much missed bitchiness of the late Princess Margaret, the Queen’s younger sister. Elizabeth is not without a small, managed temper, however. 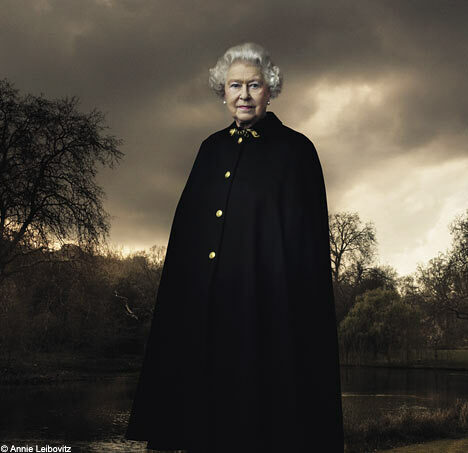 The unfortunate photographer Annie Leibovitz managed to get caught in a tempest in teapot controversy when she took a few portraits gratis to commemorate the Queen’s Golden Jubilee. Whatever the Queen was annoyed about (there is much controversy on this trivial subject) for a few minutes, the fact remains that she was unmistakably irritated, as a documentary team captured. Good-natured Leibovitz attributed the crankiness to the privilege of being in one’s eighties, and took it in her stride. Nonetheless, her lioness in winter portrait taken in 2006 shows stormy skies, a thick atmosphere of foreboding that hearkens back to the tragic week in 1997 in which the monarchy itself seemed imperiled. The real Queen couldn’t possibly carry out her job and offer up so many fragments of cleverness and emotional flares to all and sundry. Part of guarding her emotions from view also means that the Queen does not cast her psychological pearls before swine, and reserves her entertainments for her true intimates. (She is a great mimic and apparently does indeed have a lovely sense of humour. She also has a humanizing thirst for screw-ups and absurdities on factory tours and plaque unveilings.) But the tone is periodically off as when Elizabeth is gratuitously insulting and sniffy, as if she might ever have need be when, when, as the Palace and constitutionalists both have it: “there is the Queen and then there is everybody else”. A clearing appears in the midst of The Queen, an exquisite tribute to the beautiful, skittish Princess and the deeply religious, animal-loving Queen. The director Stephen Frears and the writer Peter Morgan achieve a flawless duet with this subplot involving one of the Queen’s beasts. Philip informs the Queen that a rare and magnificent 14-point stag has been found on the estate, putting her on notice for such a natural wonder. Later, Elizabeth cries briefly and for the only time when her car is stuck crossing rapids and she has to wait for help. (The obviousness of the symbolism makes it no less effective for its sheer visual beauty and psychological fascination.) Traditionally, the stag symbolizes Christ. The stag’s function is of spiritual inspiration for the weary, attempting to cross a treacherous river, which represents a great internal challenge. The stag suddenly appears and strikes several majestic poses, his wild gorgeousness and natural aristocracy obviously evoking the stunning, vulnerable Diana. This is the quiet, beating heart of the film narrated after Diana’s heart has gone still. “Oh you beauty”, whispers the Queen, humbled, as always, like her heir, by the natural world, as the stag noses around in the heather. 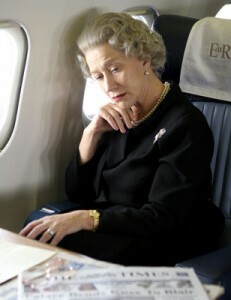 Elizabeth is still open to wonderment, this woman who has seen virtually everything of quality and exception on earth. She hears the shots of a hunting party (the male royals mourn by killing) and the bark of the dogs and she desperately tries to shoo the animal to safety. But the stag, like Diana, seems unable to read the signals and lingers too long in danger, hunted as he is. Finally he bolts, and the Queen slumps with relief. Later in the week, when the Queen is about to return to London, we learn that urban renters of a next-door estate (involved in a commercial enterprise rather like Diana’s hunter-photographers) have shot the stag. (Like the Parisian photographers who played a major role in killing Diana, they are therefore thuggish and reckless.) They have shot badly, hitting the animal’s face, causing him to suffer and bleed out over a long period, until professional stalkers could locate him and put the stag out of its misery. While the Queen expresses no interest in seeing the body of her dead daughter-in-law, she displaces her grief onto the stag and rushes to see his body, hanging at the neighboring estate, destroyed by field-dressing. She was on the stag’s side all along, though she must not admit it. The stag is unaware, like all beasts beloved by so many monarchs over the centuries, that he is in The Presence, the presence of the Sovereign, a state of psychological awe and rigid protocol. In 1999, Katharine MacDonogh wrote Reigning Cats and Dogs, a tribute to the favourite pets of monarchs past and present, who were treasured precisely for their sincerity and obliviousness to their owner’s position. After a day spent with rigid courtiers, trapped behind a wall of deference, an armful of corgis may seem like a Queen’s only real friends. * Martin Amis, The Second Plane: September 11: Terror and Boredom. (New York and Toronto: Knopf, 2008), pp.183-184. This entry was posted on Monday, September 6th, 2010 at 4:55 pm and is filed under Film Reviews, Politics. You can follow any responses to this entry through the RSS 2.0 feed. You can leave a response, or trackback from your own site. She looks like George Washington in this picture above. That is a valid observation. Annie Leibovitz intended just that, to show the linkage between America and UK historically. I liken the attention the Queen receives and handles to the same misfortune and fame that befalls a Kennedy. No matter the move they make, someone somewhere will shout they made a good decision, or a bad one. They led the country, or they left it behind. Its hard to lead millions when faced with tragedy. Are they allowed to show their true feelings? Don’t we then say what a crybaby, who are they that we should listen? Instead, emotions are pushed aside and savored alone at night in bed in the dark in dreams. And agree or not, every move they make, I’ll be watching them. Wow, Erin, I have never found the Queen that interesting. Till now–you have inspired me to watch the film. Great review; a really good read! Yes’ the scene at the river was for me, the most memorable, and may I say, very moving. This interpretation furthers it meaning to me. As for Annie Leibovitz’ upsetting the Queen, it may have had something to do with asking her to remove her tiara for a “ok, let’s now take a shot without the ‘crown'”, as A.L. called it. Lol! Betty Battenberg was furious, and rightly so.